Ether will not be getting a new coin. The upgrade is made up of five Ethereum Improvement Proposals. The upgrade makes miners' work harder, less profitable, and reduces the influx of new ether. What about the price? The short answer is, nobody knows. Updated on January 18th: New date for the upgrade is February 27th. Updated on January 16th: Ethereum’s developers have decided to postpone the network’s much-anticipated hard fork after a smart contract auditor flagged a potential vulnerability in the upgrade. Popular decentralized application and smart contract platform Ethereum is getting an update (Constantinople) these days, most likely on January 16th. Since the update will not be backwards compatible - meaning that it is not compatible with previous versions of Ethereum - it is also known as a hard fork. As for the date, the upgrade will roll out at block height 7,080,000, which will most likely fall on January 16th, and this is the reason why nobody is 100% sure about the date. 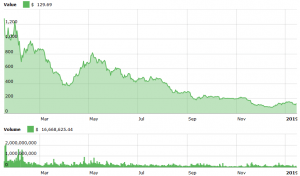 This means that Ether will not be getting a new coin. For a split to happen, a sufficient number of miners who disagree with the upgrade are needed, but there is no risk of such a thing happening now. However, there have been a number of malicious actors trying to take advantage of the confusion on Twitter, asking for people to send them their ETH so they can “replace” it with “new” coins. Two alleged “hard fork” versions are trying to steal money from users of both Ethereum and Ethereum Classic. Ethereum Nowa claims to be forking away from ETH. Ethereum Classic Vision claims to fork away from ETC. These forks are allegedly in response to regularly scheduled network upgrades in both blockchains. Both these forks are scams, and so are the official web wallets that they provide. They attempt to capture private keys. Unsuspecting users may have already lost money using this method. Ethereum node operators and miners will have to update their software ahead of the upgrade. As for anyone else, there’s literally no need to do anything: your ETH holdings will, barring any unforeseen circumstances, stay exactly the same before and after the fork, regardless of where they’re located. The upgrade is made up of five Ethereum Improvement Proposals (EIPs), which are documents explaining a new feature or change in Ethereum's code. Out of those five, four are quite technical and will improve the quality of life, but they’re also not something the average user will notice. The fifth is the only one that will openly affect everyone. Regardless, we will explain all of them in this article. "Without getting too technical, the proposed fixes and updates will result in shifting the cost of operations. Currently the "gas" (gas effectively is equivalent to a transaction charge) cost is 35 to make an operation, this will drop down to a cost of 3. In addition, there will be a lowering of cost toward running a node- Block time should stay at about 15 seconds, with transactions per second remaining at a similar average rate. In short, the changes are there to make the cost of running the network cheaper," according to Piers Courtney, analyst at GlobalBlock, a London based cryptocurrency broker. EIP 145: Bitwise Shifting Instructions (Efficiency & Speed): EIP 145 will add Bitwise shifting instructions to the Ethereum Virtual Machine (EVM). The instructions allow for bits of binary information to move to the left and to the right. This improvement means the execution of shifts in smart contracts will be 10x cheaper. EIP 1052: Smart Contract Verification (Speed & Energy): EIP 1052 allows for smart contracts to verify one another by pulling just the hash of the other smart contract. Before Constantinople, smart contracts would have to pull the entire code of another in order to verify, which took time and energy to perform. EIP 1014: CREATE2 (Scalability): EIP 1014, known by CREATE2, was developed by Vitalik Buterin. The upgrade improves the enablement of state channels, an Ethereum scaling solution based on off-chain transactions. EIP 1283: SSTORE (Cost): This proposal , the full name of which is ‘Net Gas Metering for SSTORE Without Dirty Maps’ - reduces the gas cost for the SSTORE operation. This reduction enables multiple updates to occur within a transaction more cheaply. EIP 1234: Block Rewards & Difficulty Bomb Delay: EIP 1234 is one of the most highly-discussed Constantinople upgrade. It is comprised of two components: Block Reward Reduction and Difficulty Bomb Delay. 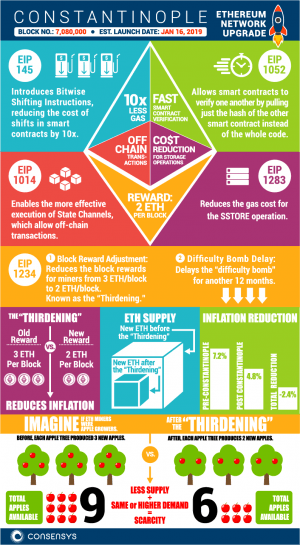 Block Reward Reduction (aka the Thirdening) will see the reward for mining go down from 3 ETH to 2 ETH, in an effort to reduce the inflation of Ether in basic supply and demand economics. The Difficulty Bomb is a mechanism that, if activated, would increase the difficulty of mining a new block until it becomes impossible and no new blocks can be mined. This EIP postpones that for another twelve months, at which point it will be voted upon again. Only EIP 1234 is obviously important for the average user, especially if they are also a miner. Delaying the Difficulty Bomb is partially due to the shift that Ethereum wants to make from the Proof of Work (PoW) consensus algorithm to Proof of Stake. The “bomb,” effectively a timer that progressively makes miners' work harder, reduces the influx of new ether, and also makes mining ETH less lucrative. It is partially designed to chase away PoW miners and welcome the new mentality of staking coins to create new blocks. However, since the Casper protocol, which will make the shift, is not ready yet, the delay keeps the old way of mining still running. But not all is completely lost for miners. Recently, developers from Ethereum’s open-sourced community have tentatively agreed to implement ASIC (application-specific integrated circuit) mining hardware resistance into the project following further testing on the proposed code. Mining using ASIC chips would be blocked with this update dubbed ProgPoW (Programmatic Proof-of-Work) and instead replaced with general purpose, or GPU (graphics processing units) hardware. This would ensure that GPU mining remains competitive. The short answer is, nobody knows. Markets are unpredictable and previous patterns don’t have to repeat. The long answer is that theoretically, reducing the influx of new ether should drive up the price thanks to supply and demand laws. However, history suggests that the price could drop following the hard fork. Still, the coin has been going through difficult times in terms of price throughout 2018, and speculating on the price would be just that - only speculation. "In the short term, shortly before and during the fork expect to see price volatility pick up although we would expect to see things steady out after there is consensus on the chain. 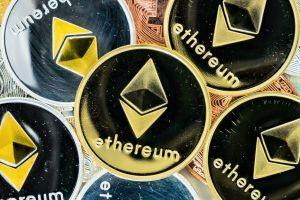 It has been widely reported that this hardfork is expected to relieve some of the tensions that have been building regarding ETH and is likely to be positive for the valuation of Ether in the foreseeable future," Courtney said. “The Constantinople hard fork will be an exciting evolution for the Ethereum community. With the implementation of efficiency, speed, and lower costs, we are moving closer towards the full realization of Ethereum’s potential,” writes Everett Muzzy, Content Marketer at blockchain software technology company ConsenSys.